p>Are you still worried about cannot eating your favorite food? Are you still worried about cannot having perfect muscle? Are you still worried about delaying your fitness because of work? Are you still delaying your fitness because you hate sweating? Do you want to be able to get a workout while watching movies, reading , working, traveling, or walking? If your answer is "yes", please chose our VLikeze Muscle Trainer. ★ Our high quality EMS equipment stimulates your abdomen, arm and leg muscles in a convenient and extremely effective way which is the ultimate tool of any time of the day. ★ Although diet and exercise are always important in your fitness process, our EMS machine can be used during the exercise, in addition to being used at leisure. ★ Improve muscle spasms, Fat burning, muscle building, suitable for fitness shape. Just 1-2 times per day, 12 minutes per time. ★ Rechargeable, no need to install batteries, reduce unnecessary trouble. ★ Easy to operate with 6 modes and 10 intensity levels. →When using trainer for the first time, try low intensity to adapt to EMS machine. You can try the most suitable grade later. →After the completion, re-cover the adhesive pad with protective cardboard to prevent the pad from drying. →Replaceable gel pieces. When you use the Ems gel sheets For about 20-30 times or after the Gel sheets is not sticky, you need to replace the new Gel sheets. → Do not place it near the oven or stove to avoid damage the machine. ☼ Measuring rule*1: Accurately measure your waist, hip, arm circumference, and thigh circumference. ☼ Ice towel*1: After sweating, use it to get a cool feeling. The best product for after sports. Fitness Support & Fat Burning: This muscle trainer is a assistant massager tool while doing an exercise. It can burn your fat with the pulse massaging method to keep your muscle more healthy. 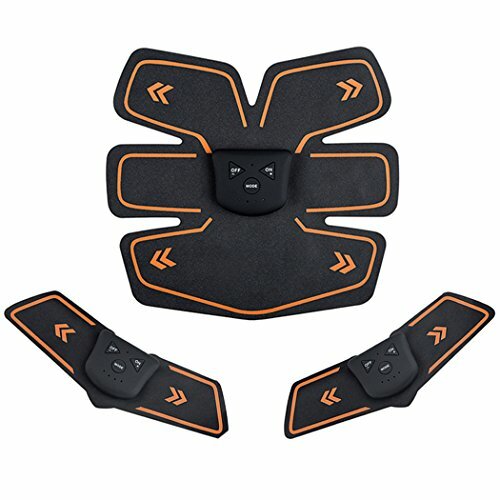 Easy to Use: Just adhered the muscle trainer pad to your body, it will train your muscle automatically, without anything you should do. You can enjoy reading or a music or a movie while using this muscle trainer. Different Massaging Frequency: This muscle trainer has 6 different massaging frequencies with 10 strength modes. Different frequency and strength mode fit different people, men or women. Portable & Easy to Clean: The muscle trainer is made of quality PU and ABS material, with a light weight and small. You can carry with it to anywhere, even you have a trip. Take a clean paper to wipe it out if you need to clean it up. Easily. Low Power Consumption: This muscle trainer is powered by a built-in Li-Ion battery of 180mAh. Full power can work for over 3 hours. Efficient power consumption. If you have any questions about this product by Vlikeze, contact us by completing and submitting the form below. If you are looking for a specif part number, please include it with your message.